I also find it makes a great gift for neighbors, teacher or friends. 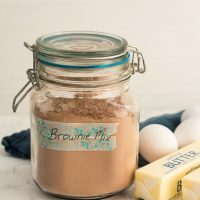 How to make homemade brownie mix with cocoa powder? 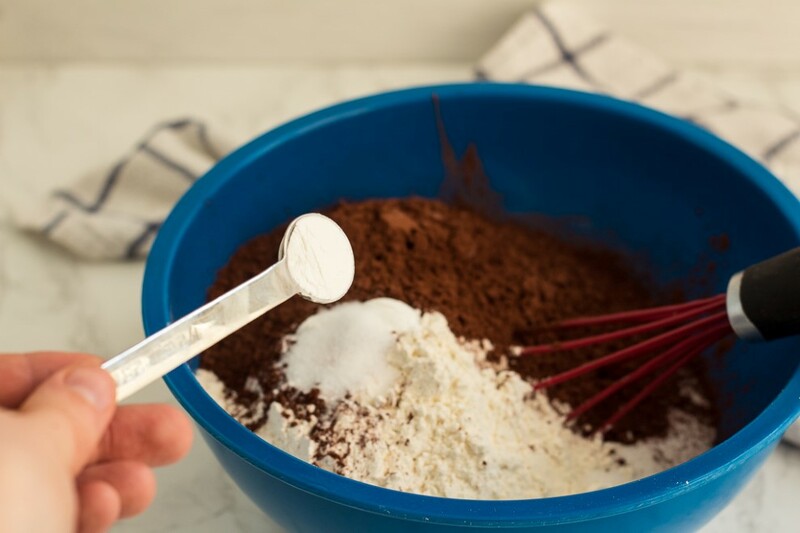 To make homemade brownie mix, you’ll need a large bowl and whisk and the following ingredients. I like to double or triple the batch so I have brownie mix on hand. Dump all the ingredients into a bowl, whisk together well and store in a jar or tightly covered container. Ta da! 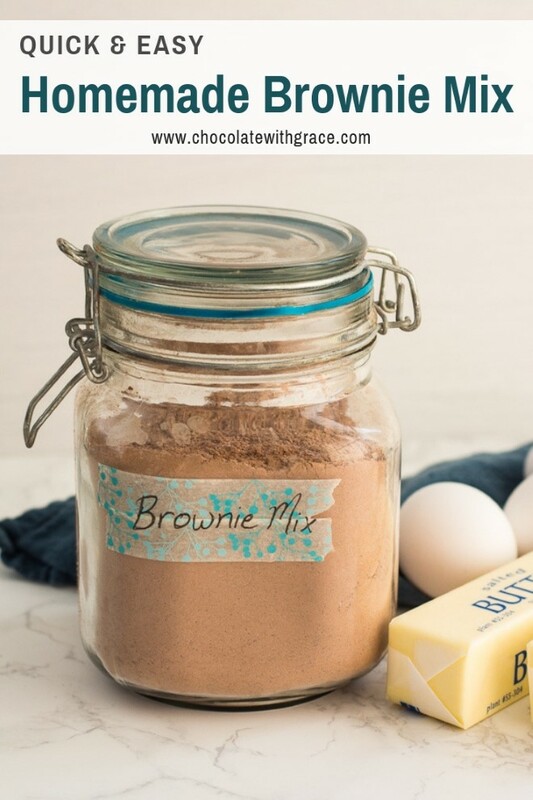 Homemade brownie mix couldn’t be easier. 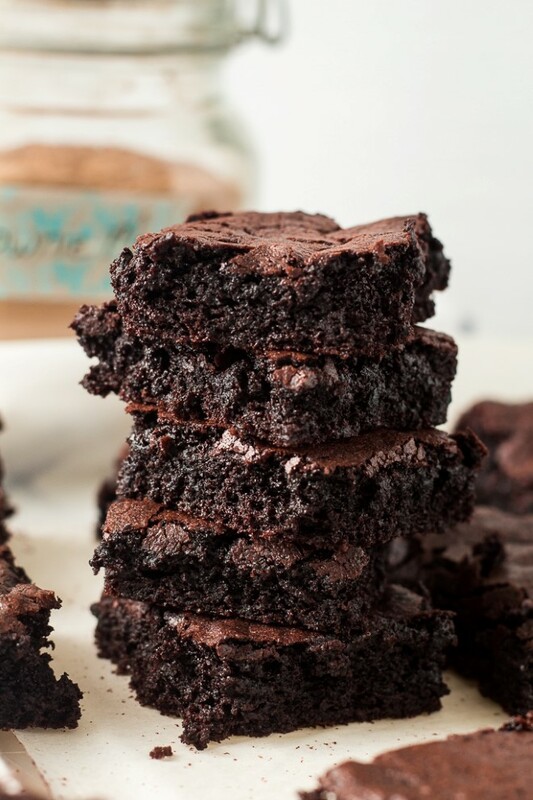 How to make brownie mix into brownies? Now, when you want a batch of brownies, measure out 3 and 3/4 cups of brownie mix and dump in a large bowl. Add 2 room temperature eggs and 1 cup melted butter or oil. Mix well. Pour into a greased 9 x 13 inch pan and bake at 350 F.
If you only want and 8 x 8 inch pan of brownies, you can just use 1 3/4 cups plus 2 tablespoons of mix and 1 egg and 1/2 cup melted butter or oil. 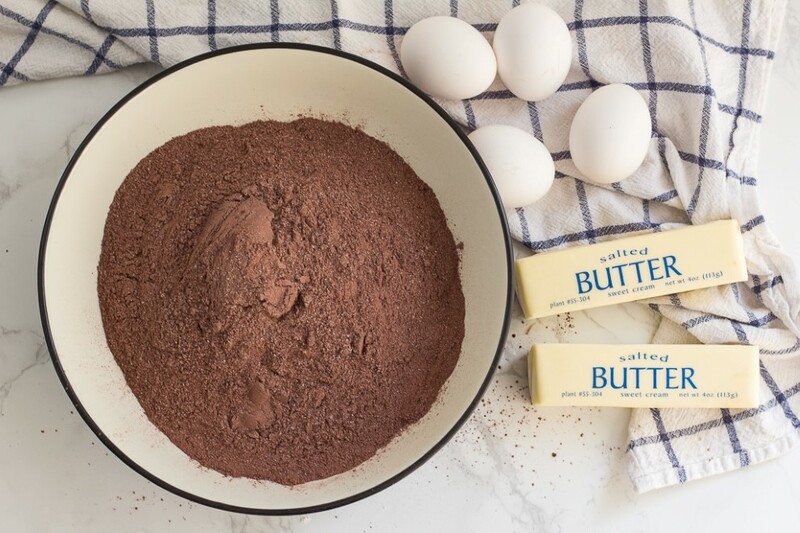 Can I substitute butter for oil in brownie mix? 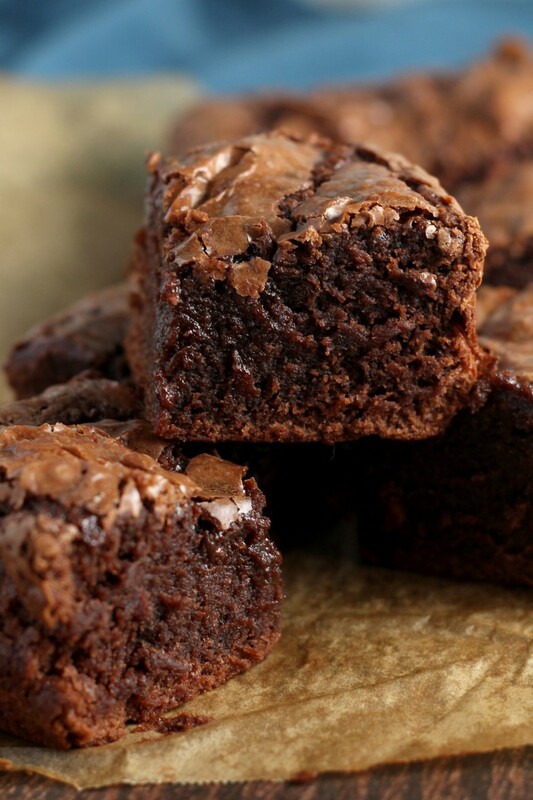 Oil and butter can be used interchangeably in brownies. I like using melted butter best because it give a great flavor. Vegetable oil is easier to use since you don’t have to mess with melting it. 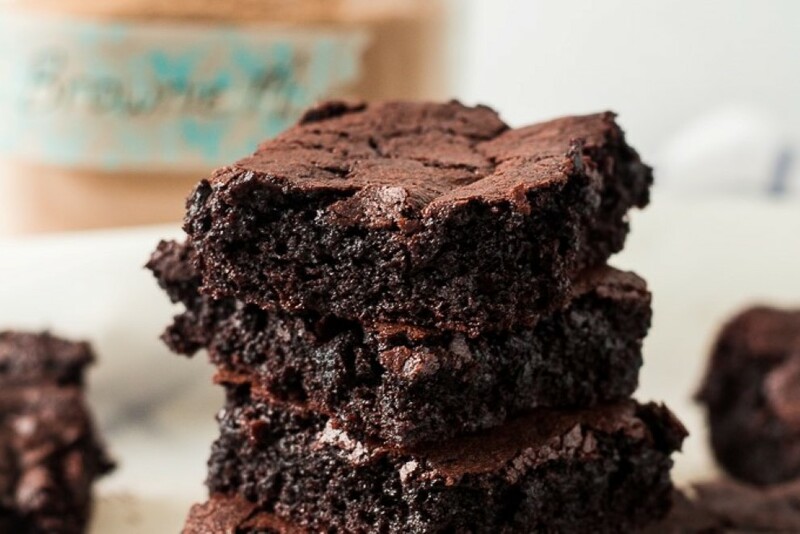 Oil will also give your brownies a slighter moister feel than butter, since oil coats the proteins of the flour and butter soaks in. Sometimes I use half butter and half oil to get both the flavor and moister texture. What else can I use homemade brownie mix for? Besides making a traditional pan of brownies when the craving hits, you can also use the box mix to make fancy brownies. Simply add some mint extract and use a pan of brownies as a base to my Mint Brownies with Chocolate Ganache. You can also add chocolate chips, nuts, peanut butter cups, crushed oreos or whatever add ins your heart desires to take these brownies up a notch. 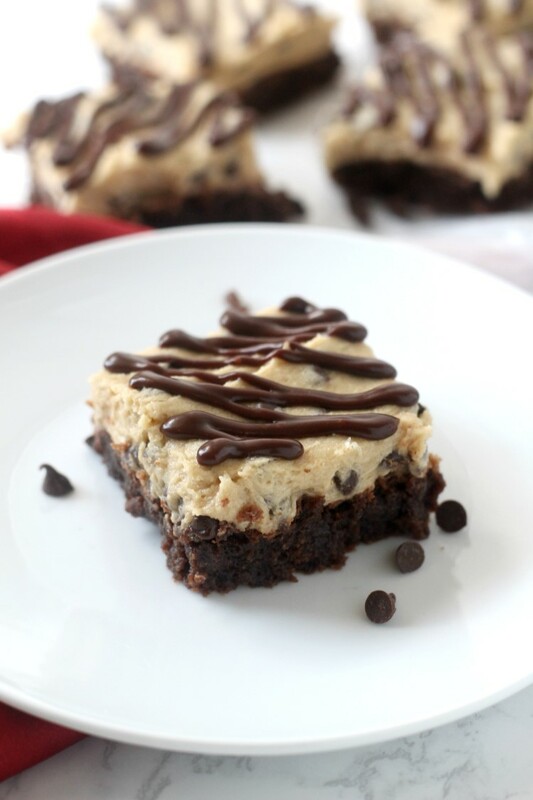 Check this post by Like Mother Like Daughter for 15 ways to make box mix brownies fancier. 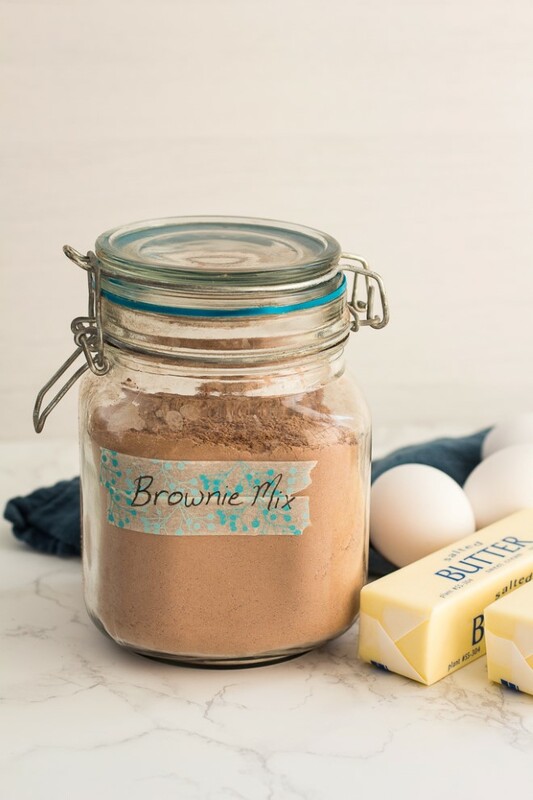 Homemade brownie mix is a great DIY pantry staple. Let me know if you make this recipe and what you think. Tag me #chocolatewithgrace on Instagram and be sure to follow me there. To make the mix, whisk together the flour, cocoa, sugar, baking powder and salt until well combined. Store in a jar or another tightly covered container. I like to double or triple the batch so I have mix for several batches of brownies at a time. To make the brownies, add 3 3/4 cups (1 batch) of brownie mix to a large bowl. Add 2 room temperature eggs and 1 cup of melted butter and vanilla. Beat together. Pour into a greased 9 x 13 inch pan**. Bake at 350° F for 28-32 minutes or until center is set. *Either regular or dutch process cocoa powder is fine. Dutch process cocoa powder makes them darker and richer. **You can make brownies for an 8x8 or 9x9 pan too. Simply use 1 3/4 cup plus 2 tablespoons of brownie mix, 1 egg and 1/2 cup melted butter. I absolutely love this recipe! I never knew having a quick and easy brownie mix that is pre-made and set aside ready to go would become so useful! We love keeping this on hand when my chocolate craving stirikes. I love to send homemade brownie mix to my daughter in college! This is one of my favorite neighbor gifts to give during the holidays! Such a delicious recipe!